We eat salad almost every single night with dinner, but if I told you about all of them, you’d be bored to tears. Ninety percent of the time it is some variation of arugula, radicchio, endive or butter lettuce with a basic vinaigrette. At least in the everyday salad department, I like it simple. Most of the time. Other times, I am crafting a plan, and Monday night that plan included me avoiding our leftovers by being too full for them. Time for a confession! I’m terrible at eating leftovers. Day old meat has this, I don’t know, musk to it that turns my stomach. I can smell it before I taste it; I can barely choke down two bites. Just about the only foods that I find equally good, if not better in the days that follow are quiches, tarts, soups and legume-full things, like that chili. Unfortunately, on Monday it was just piles of that pappardelle ragu. Alex couldn’t wait to dive into it, but I made us a big, elaborate salad. Now, I know there is nothing new about endive bulked with arugula, red onion, crumbled blue cheese, apples and toasted nuts but I will argue that this everyday salad warrants mention because I tried a spicy, candied pecan recipe I’ve long had bookmarked and loved it. Toasted spiced nuts are a fairly particular thing; around the holidays you see so many recipes, it’s nearly impossible to see the great ones from the greasy, heavy, oddly-flavored or soggy. In the end, of course, it’s just personal taste that leads you to one over the other and mine is very pleased with the texture and kick of this. Consider it, will you? And let me know if you’ve got a version you swear by. Whisk your salad dressing the bottom of the salad bowl that you will use for serving; pile the ingredients on top and toss it when you’re ready to serve to prevent sogginess. I love this because doing everything in-bowl saves dishes, always a plus when you’re hand washing dishes. I saw this trick on the Barefoot Contessa, and have used it ever since. I love raw onions in my salad but don’t like their bite to be overpowering, so I soak them, already sliced, for a few minutes in cold water and it greatly reduces their sting. The longer you leave them, the more mild they’ll get. The absolute easiest way to wash greens, especially those inevitably sandy, gritty ones like arugula and bibb lettuces, is to plunge them in a large bowl of very icy water. Swishing them around briefly sends all the sand and grit to the bottom of the bowl. I pick them out, toss them in the spinner and whirl away. I find that well-washed and dried hand-cut lettuce mixes outlast their pre-bagged counterparts by nearly a week. Preheat oven to 325°F. Spray baking sheet with nonstick spray. Combine corn syrup and next 4 ingredients in large bowl. Stir to blend. Add pecans; stir gently to coat. Transfer to baking sheet. Regardless, I am actually as weird as you are about leftovers. I just can’t eat them. It took until several months ago for me to even touch a slice of cold pizza. Sometimes my cheapness and unwillingness to throw out perfectly good food wins over and I grimace while I take a bite, but most of the time I just bring myself to eat something that’s been sitting in the fridge. My fiance is the exact opposite – he even saves already dressed salad (ugh). I feel so picky but I just can’t help it! 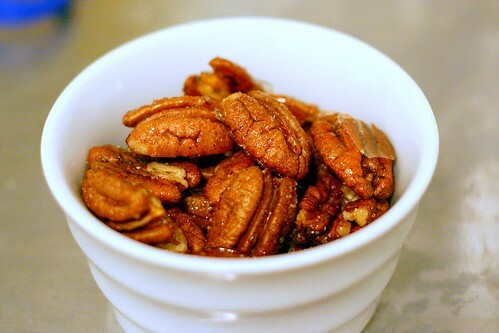 I have made that recipe for pecans so many times, and it’s always a huge hit. If you don’t have corn syrup, you can substitute honey and it’s just as good. Rachael, I think that you need something sticky to get the spices to hold to the nuts–I can only think of sugar-equivalents to make it work, but there must be some substitute that isn’t sweet. As for leftovers, I’ve been very good lately about putting them into tupperwares, which are then easy to grab on my way out the door for work in the morning. I hate leftovers for dinner, but don’t mind them at all for lunch, especially when the alternatives are all uninspiring. And I find leftovers more palatable in individual servings, instead of in a big mass in a pot or a bowl. Rachael — I was itching to replace the white sugar with brown and maybe add a hint of cinannom, but I deferred to the recipe, at least in this first round. I can’t imagine messing them up, though. Also, I only made a 1/2 cup batch for our salad and SO wish we had more. Now there’s some leftovers I can get behind. Gretchen — You are so right. Compared to buying a overpriced salad at lunch I make better, and with better ingredients, at home, I would absolutely prefer my own leftovers. In fact, we have individually wrapped pieces of lasagne from two weeks ago in the freezer… hmm… Thanks for the idea! The thing with some leftovers is that they are difficult to reheat and be as good as they used to. ThatÃ‚Â´s why I usually find a new way to use them, just reinventing them and they are no longer left overs. For instance, last night I used the French onion soup you posted a while ago as a flavor base for a quiche, with potatoes and loads of cheese. Lovely! With meat, your best bet is to slice it thinly, add a spice mix spread, cheese and some veggies and make a great sandwich. I was JUST thinking about making a blue cheese salad for a dinner later this week! I must have picked up subliminal messages from your flickr pics :-) Can’t wait to try this. YUM. And sort of similar to my salad last night: butter lettuce (my favorite), spinach, walnuts, goat cheese, pears, red onion. Now, a vinaigrette question for you, Ms Smitten! I love a nice, sweet (key! ), syrupy kind of thick balsamic vinaigrette and I think you might get it that way by simmering it in a pan, but I’m not exactly sure how to do this…any thoughts? Also – there are very few store-bought dressings I like, so any other recipes are appreciated as well! melt the butter, mix everything but the nuts together then toss with the nuts. spread on cookie sheet & bake on 350 for ~10 mins. I’ve been popping in on your Smitten Kitchen on and off. Thanks for the delicious ideas and fab photos. On the spiced nuts, I haven’t tried corn syrup, but will next time. I’ve used peanut oil and brown sugar for the sticky and sweet. And I love throwing some Chinese five spice on or even some curry powder. Great for holiday munching! Remind me to send along my mom’s Blueberry French Toast Cobbler recipe. Try it and I swear you’ll have a new favorite make-ahead brunch feature. That looks scrumptious. I love hearing about different ways to put salads together for those times I feel I am going to look like a piece of lettuce from eating the same thing over and over. (Whoa – long sentence.) Thanks! That’s a powerful salad! Beautiful and tasty – perfection! Gorgeous looking salad! I was thinking of those rosemary roasted nuts Bridget posted about when I saw your pecans. I think I got the version I make from an episode of Barefoot Contessa, but she made them with cashews only, I make them with almonds, pecans, walnuts, anything! I had never thought about putting them in a salad though, what a wonderful idea! Oh, and what vinaigrette did you use, might I ask? Thanks! so, let me ask you… would soaking the onions like you do prevent “tasting” them for the next 2 days? (get my drift here?) Its like, all of a sudden, raw onions like to stick around with me for a few days so ive stopped eating them all together.. except sauteed onions… i could those by the bowl.. whenever i make meatballs or tacos, if i grate the onion i can get away from them hangin around like an un-wanted guest.. but in salads? on sandwichs? OY the misery.. oh how i miss thee… whatcha think? You lost me a whisk. I make salads all the time too. But I don’t even own a whisk. Oh and I got a portable dishwasher. Perfect for a NYC apartment that does not come equipped. I haven’t done a dish since November. My whole life is better. First off, I’m with you on the leftovers. I just can’t stomach day old food, no matter how good it was. Luckily, my husband and I have the perfect marital arrangement. He eats all the leftovers for lunch the next day and I don’t have to feel guilty about food going to waste. Secondly – I love your tips, especially the dressing on the bottom of the bowl idea. Genius! Mmm, funny, I was planning on making a salad tonight. Also funny, it’s reverse for me, I’ll eat leftovers fine, but the bf despises them. Oh yes, the salad I’m making tonight: I prepped your Caesar dressing recipe and it tastes pretty darn good! Can’t wait to have it over salad! Tupperware makes these lettuce / produce storage containers that really help keep veggies fresh! We got 2 weeks from a head of romaine once. SO love the tips at the end: I am a huge fan of skipping extra dishes, making things easier and extending the life of greens! I make candied and spiced nuts often and usually set some aside to throw into that week’s salad. Yum! I don’t object to eating leftovers. My problem however, is that I suffer from refrigerator ADD and quickly forget the treasures I stow there. Then I often cry as I toss out some really prized leftovers whose day (week?) has passed. Your salad and pecan photos are gorgeous. I want that right now. I find that greens I wash myself last longer too. I even just store them in my salad spinner. It takes up too much room in the fridge, but I can’t believe how long they last. A week or two. I make spiced nuts using a whipped egg white. coat your nuts with the foamy egg white and then add your spices/sugar and bake on parchment or silpat. Very nice lo fat lower sugar version. I find I make far less salad in the winter than the summer, falling into a more predictable cold salad = summer / hot veg = winter schedule. But, whenever I am tempted by a pretty salad, I make it regardless of the season and wonder why I don’t make it year round. Yours is a pretty salad. Temptation here I come. This looks SO good! I love red onion…it has such deep flavor and changes so much when you cook it…almost biting when raw but sweet when cooked. Mix all ingredients except the olive oil (I make it in a salad dressing bottle and just shake to combine), when well mixed add olive oil and shake/wisk to emulsify. I serve it with a spinich salad with bosc pears, brie cheese, pecans and cucumber. I usually double or triple the recipe and it keeps for a week or so. For cupcake- if you can’t get that onion-ey or garlic-ey taste/smell out of your mouth, take a stainless steel soup spoon, stick in the freezer for a minute or so, and rub your tounge with it. The chemical makeup of the stainless steel helps break down the oils or whatever that makes the smell stick in your taste buds, and freezing seems to help. I used to have that problem with garlic on my tounge and my hands, now I always chop my garlic with a stainless steel handled knife and never have the problem. Sounds silly- but I swear by it! Didn’t know that about onions but it makes sense. I am a big fan of candied pecans and have a killer blue cheese/grape/pecan salad that I can’t go long without eating. Here’s a couple of things I like in my salads: finely diced shallots instead of red onions. Another is “La Bodega” sherry wine vinegar, made in Spain. All time best vinegar. (Am I the only person who still uses “La Bodega?) Or, Meyer lemon juice (yes, I do live in California) instead of vinegar. Thank you, Celia! I will try it. Another awesome addition (when you have the time) is pomegranate seeds. Colourful, luscious and this nice crisp burst of sweetness. Along with a little crumbled goat cheese and you are in heaven. Liz — They look great! My subliminal messages from your pictures determine I should make more. Rosie — Sorry I’m so helpless about this; we’re not such big fans of sweet dressings so I rarely make them. I know that the fancier and more aged the balsamic, the more it is naturally thick and syrupy and I have no doubt that simmering down a less-expensive one would do the trick. If nothing else, a squeeze of honey. This is I will occasionally do to balance out an overly-acidic dressing. Bridget — Those sound wonderful! I’m a little funny about rosemary (pine needles!) but it’s growing on me, like with nuts or in bread. Yum. Annie — I would love to try your mom’s Blueberry French Toast Cobbler recipe. Thank you! Pebbles — Oh, you are in the House of Shamefully Long Sentences, don’t feel bad! I hear you about the same greens every day; this was an excellent detour. Last night, though, we were back to the boring! LyB — Our everyday dressing is here: https://smittenkitchen.com/2006/12/paris-instead, though I might swap the champagne vinegar for others, such as balasamic or red wine, at times. Cupcakes — Heh, I think I’m lucky not to have that problem, though I’d probably avoid raw onions if I did. (I have certain ethnic joints by my office that I avoid for similar reasons.) Maybe someone else has advice! Kristen — Beautiful! I can often talk Alex into them, too, especially when he is hungry and dinner is hours away. Yet it doesn’t keep me from finding scary leftover science projects in the back of the fridge now and then. Ghuh. Yvo — Glad you liked the Caesar. I use it All The Time. Rachel — Oooh, I’ve always wanted to go to a Tupperware party! Surely, they have them in Manhattan somewhere, right? Janelle — Thank you. And the recipe looks wonderful. Kevin — Yup, it’s pretty much like that. And then I’m all sad: But I loved that salad! Alex: I suggested we eat it three times and you kept saying no. Me: Shush, you. Grant — I’m glad others have noticed. Considering, ahem, what has happened when we’ve left the processing of our salad greens to others, as well as the dullness in flavor of those mesclun mixes, I’m happy to be going old-school these days. AngAk — I’ve seen that approach and am glad you brought it up. I want to try this, too. Almost vegetarian, Claire, Celia — Thank you. Mrbunsrocks — Oh, that sounds awesome. Maybe if I can get my husband to take apart the pomegranate he bought over a month ago (but oddly, is still in stellar condition) we can try this. Hear that, honey? Just something IÃ‚Â´ve seen in the web that might be of interest for NYC foodies. i know what you mean about the onions. i have another trick to deal with them, though. instead of water, i toss the onions in whatever acidic ingredient i’m going to use for my dressing. i do this first thing, and then make the dressing, etc. lemon juice, champagne vinegar, whatever… toss the onions with just a skosh of the acid. toss them really well. then leave them alone till you’re ready to assemble your salad. i promise it’ll take the heat out of your onions, and unlike water, the acid will both mellow out and sweeten the onions. try it sometime.. i swear it works! Seasoning Mix: 1 part cayenne, 2 parts Paprika, 3 parts sugar, and salt to taste. Lightly coat with olive oil and toss gently to mix. Bake @ 350F for 10 minutes or until nicely toasted. I just wanted to say that your lovely salad inspired me to make my own. Not the same, but still good! Deb–just love your irreverent self showing through your blog. Not too mention you have a mighty fine sense of the epicurean. I’ve been making these spiced pecans from Martha Stewart’s Hors D’Oeuvres Handbook–she has several recipes for spiced nuts–but this one combines the sweet, salty, protein, and spicy all in one–be forwarned–they are highly addictive. Heat oven to 325 degrees. Place the nuts in a single layer on 2 rimmed baking sheets. Toast until the nuts are fragrant, 10 to 15 minutesÃ¢â‚¬â€watch carefullyÃ¢â‚¬â€nuts can get overdone. Rotating the pans halfway through cooking. Meanwhile combine the sugar, salt, and ginger in a small bowl and set aside. Combine honey, 2 tablespoons of water and the oil in a large saucepan and bring to a boil over high heat. Reduce the heat to medium and add the roasted pecans. Cook stirring once or twice, until all of the liquid has evaporated, 3 to 5 minutes (I find the are almost immediately coated and don’t need 3-5 minutes). Transfer the mixture to a boil, and add sugar mixture, and toss until well combined. Spread the nuts in a single layer of parchment paper to cool (I just use wax paper on the same cookie sheet I roasted them on). These pecans may be kept in an airtight container at room temperature for one week. Thanks for the recipe for the nuts – tried it tonight and everyone enjoyed it! Honey is an excellent alternative to corn syrup, especially when there are so many varieties of honey which can be used to cook. Personally, I buy most of my honey from Holy Food Imports (www.holyfoodimports.com) because they produce their products in Israel, but sell them in the US and the quality is great. I was so happy to find this recipe when I needed a quick go-to for candied pecans! So many other recipes I’d looked at included egg white, and I wanted to be able to share these with a vegan friend. I made a one change to ingredients – I used maple syrup instead of corn syrup, and instead of the whole foil, bake, mix, foil thing I just did the whole batch on parchment paper and it worked out beautifully. Went perfectly with my roasted beet salad! This was so much easier than I thought it would be! I foresee candying many more nuts in my future…thanks again. These are really awesome. I have made them with Lyle’s Golden Syrup twice now instead of corn syrup and it works out really well. I don’t have a problem with corn syrup, it’s just that we have the golden syrup on hand, and it seemed like a good substitution. I just made these (only ground cinnamon, ginger and orange peel) and chopped some of the pecans still warm for inclusion in oatmeal. A beautifully delicious crunch for breakfast! I have since used the basic technique of a whipped egg white + 4 cups nuts with different seasonings, including a BBQ spice rub with a little cayenne. It works great! I look forward to trying your recipe! I like the sound of the sweet/spicy combo. I just made a hybrid between this recipe and the “sugar-and-spice candied nuts” and it was delicious! I used all the ingredients in this recipe (but swapped brown sugar for white), but also added a pinch of cinnamon and smoked paprika. To make cleanup easier, I dumped all the topping ingredients into a big glass measuring cup, zapped it to reduce the viscosity, then dumped the pecans in to mix. I poured it out on a greased, foil-lined baking sheet and put it in the oven. Afterward, I separated the nut pieces on the same piece of foil, and I didn’t have any issues with sticking. Just made these pecans. Yummy!! Deb – this is a complete departure from your request for candied pecans, but this recipe for candied almonds with a thin, bitter layer of cocoa is so delicious I thought you might be interested: http://lcbo.com/lcbo-ear/RecipeController?language=EN&recipeType=1&action=recipe&recipeID=1351. Crazy good stuff! Deb, I have been making this same recipe for years–loved as a snack and in salads (blue cheese crumbles, blackberries, pecans w/balsamic viniagrette), but also awesome when a whole candied pecan is dipped in white chocolate. I up the cayenne to 1/4 tsp and when you pair that spicy nut with white chocolate, it is heaven. I have cute little candy molds where I place the nut then melted chocolate. White chocolate seems best for some reason. I always make three batches of nuts, but I learned that the recipe does not “double” well. Just make three separate batches. BTW, I am new to the site, but positively addicted. I find it fun to see how many of the recipes you review I have actually made! Just made a batch of these with honey instead of corn syrup. Delicious! Love the spicy kick! I lined my baking sheet with parchment paper instead of oiling it so when I took them out of the oven, all I needed to do was remove the parchment paper from the sheet and separate the pecans. No transferring to foil needed! made them last week! awesome, except i’m not much of a spicy person so i used cinnamon instead of cayenne. I ate them plain, and put some in a carrot cake i baked, instead of salad. oops! I did not look all the way through so maybe someone already suggested this. if you do not want to use something sweet to adhere you spices to the nuts use egg whites. I have used them to make my daughter’s favorite sweet nuts for years. PS thanks so very much for the gluten free. I have been trying to find things for my youngest child and it is often a real challenge. Made these nuts tonight and loved them :) Excited about the new recipe. Thank you! Deb, have you ever made this same recipe with walnuts? Around here, they are less expensive than pecans! I haven’t but love walnuts and think it would be delicious. Butter lettuce… fresh raspberries…. rounds of silky goat cheese…. and these toasted spicy pecans… Almost don’t need dressing, but a very light one (walnut oil, lemon juice) was wonderful. I make them with Chinese 5 spice, butter and brown sugar. No measurements, just what looks right.